Once again it’s time to take a romp into the world of Young Adult fiction, and sticking to my favorite genre overall, Science-Fiction. Some of the most interesting stories come from Young Adult fiction, but then again so have some of the worst, I won’t mention any names (cough, cough, Twilight, cough, cough), but I think you know some. Anyway this book and what looks to be a series is among one of the most interesting. I will admit it was a bit frustrating, but in a fun way. Frustrating because it was so cleverly written that it kept me trying to guess what was happening next, and constantly changing that guess. 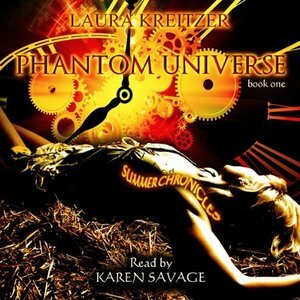 This audiobook is read by Karen Savage, and I’ll be one of the first to jump on her bandwagon. Ms. Savage captures the voice, or rather the inner-voice of Summer, the main character in the story. She also is able to differentiate the separate voices of the other characters with ease and let me tell you that is no easy feat. The voices range from Scottish and British accents, to pirates, to Native American, to Canadian, and even some Southern American. Each one is performed beautifully in order to enhance the telling of this romp through time. So now I have one more audiobook voice artist to put on my list to listen to more often. Oh, I see you caught that time travel hint. Well the time traveling done in this first book of the Summer Chronicles is only one way with a large amount of people traveling 200 years into the future. But before I get caught up in that aspect, which was one of the frustrating parts of the story for me, remember, frustrating in a good way. Summer lives in the modern day world as a slave. Yes this book talks about child slavery and gets a bit rough, but it is all done to further the story and create the what turns out to be a strong character in Summer. Summer was sold into slavery by, what at first seems like her mother, but more is learned to deter that idea later in the book. She is sold at the age of 4 and is beaten with a whip until she learns to not make any noise. The lessons of the whip are so harsh that Summer, even at the age of 16, does not talk. She communicates with expressions and by writing on a very few trusted people’s palms. I have to throw in at this time that this is another time to send kudos to both the author and the reader in representing the thoughts and actions of summer, the author provides the perfect descriptions and the reader presents these words in such a manner that I could visualize easily the facial expressions and emotions of Summer. At the age of 6 Summer is sold to a Captain of a Pirate ship. Yes this is modern times, and the pirates, capture ships and sell the cargo. The Captain of this ship has a liking for large screen TVs and captures container ships carrying this cargo. Throughout her life on the ship, Summer never talks and becomes the Captain’s favorite because she doesn’t talk. This section of the book is told with flashbacks throughout her life on the ship to modern day of Summer at 16 years old with the flashbacks talking about different things that shaped her character. One such event is one where she is nearly raped by a crew member but is saved by another slave, a boy near her age by the name of Landon. Summer and Landon become best friends from then on. About halfway through the book a surprising event happens and the Pirate ship is boarded by The Secret Clock Society in search of Summer. Jaiden, a slave from before Summer was sold to the pirates, is sent to find Summer, but instead she betrays the Society and helps Summer escape just as the ship explodes. Jaiden and Summer manage to make it to shore, but are unsure of the fate of Landon. On shore a strange thing happens and the two wake up to the intrusion of a military force capturing the two girls and rounding up what are called “Outlanders.” Summer strangely begins to feel something for the commander of the force, Gage, and for some odd reason trusts him, this trust comes from deep within and she doesn’t understand why when she has never trusted anyone in her life, except for Landon. Gage and the others are members of the Canadian military and reveal to Jaiden and Summer that they are now in the year 2210. This is where it got really frustrating for me. How did they travel through time? Why? Summer is examined by a medical personnel and it is decided she is not in any shape to be taken to the Outlanders internment camp. So she spends some time in a hospital where the years of starvation and severe beatings are treated. In the year 2210 the Canadian government has taken over most of the civilized world. While the United States and the rest of the world were busy with World War III, the Canadians were tired of wars and wanted peace and were able to invade through covert actions and behind the lines invasions. I found this odd but so did some of the other characters from the past so this part was not treated too lightly and an explanation is provided, but I will leave that up to you to discover. One of the things that caused the Canadians to be able to take control was an “Exodus,” in which 200 million people disappeared. So how did Summer travel to the future? and why? Well that is the fun of this story, and it would be a spoiler, so I won’t be telling you, but it completely changes the character of Summer and all her friends new and old, and starts a saga that is only begun in this book one of “The Summer Chronicles.” I’ll warn you now, don’t try and figure out why or how, just enjoy the great storytelling and when it is explained, just say, “Ahhh, of course.” Oh also as is in most Young Adult fiction you have a bit of silly teen romance going, but that is not the bulk of the story, so just let that slide as well. Glad you had a positive response to this book. So did I. I avoid reading other reviews until I get mine done. Funny how we focus on different things.